Diamond or Opening: This is the description of the open area formed by strands and bonds. Normally the open area is diamond shaped. SWD or SWO: Short way of diamond, or short way of opening is the dimension measured across the sheet in a direction parallel to the smallest dimension of the diamond. LWD or LWO: Long way of diamond or long way of opening is the dimension measured across the sheet in a direction parallel to the largest dimension of the diamond. Mesh: This is the nominal distance from the mid-point of one bond to the mid-point of the next bond measured across the SWD. Mesh is expressed in inches. Opening Size: The area enclosed by bonds and strands. Overall Thickness: This is the finished thickness and often determines the selection of framing members. Percent of Open Area: These important relative percentages are used by designers to calculate the degree with which light or air can pass through a piece of expanded metal. Pitch: The measurement from a point on one diamond to the same point on an adjacent diamond. Strand: The single metal strip which forms the border of the diamond, or opening. Strand width is the amount of material advanced for expanding as differentiated from strand thickness which is the thickness of metal from which the expanded metal is produced. Style: The gauge or thickness of metal from which expanded metal is made. Usually, but not always, this conforms to manufacturer’s standard gauges. Style is expressed by a number. Grating style is expressed in pounds per square foot. Formability: Each piece should be able to take a 90 degree bend with a 1/4 inch inside radius in either direction, without fracture. Leveling: All expanded metal products except grating are leveled after having been expanded. Out of Square: Expanded metal sheets are generally not perfectly square when finished. Sheets must be re-squared by shearing on all sides for perfect squareness. Reshearing at the mill is not usually done since most sheets are sheared to size by the customer. Camber: Bow in sheet. It is measured by placing a straight edge along the concave side of the sheet parallel to LWD, touching both ends of the sheet. The maximum distance between the edge of the expanded metal and the straight edge is the camber. A sheet may be within tolerance and still have camber. 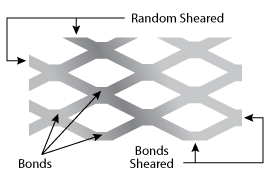 Regular Expanded Metal: Sheet simultaneously slit and stretched into a grid, non-raveling open mesh. It is readily available in carbon steel, aluminum, and stainless steel. Flattened Expanded Metal: Manufactured by processing regular expanded metal in a rolling mill. This rolling reduces the thickness of the sheet and provides a smooth flat surface. Expanded Metal Grating: Sheet or plate expanded into a structural open grating ideal for catwalk and platform application. Decorative Expanded Metal: Manufactured with unique shaped openings which possess great appeal for architects and designers. Stair Treads: Expanded metal grating stair treads are fabricated using 4# grating, angles and bars. They are shipped ready for installation on the job. Finishing: Limited finishes can be accomplished at manufacturing plants. This includes hot dip galvanizing and pre-galvanizing. Sheet Size: While expanded metal can be manufactured in many varying sheet sizes, practical limitations are such that it is wise to select sheet sizes shown by catalog. Sheering: The terminology when cutting expanded metal.